The Robocop salutes as a police official explains its features. Dubai Police has welcomed a new member to its force and he is super smart. He is ready to engage with Dubai’s residents and millions of tourists across the city’s streets. 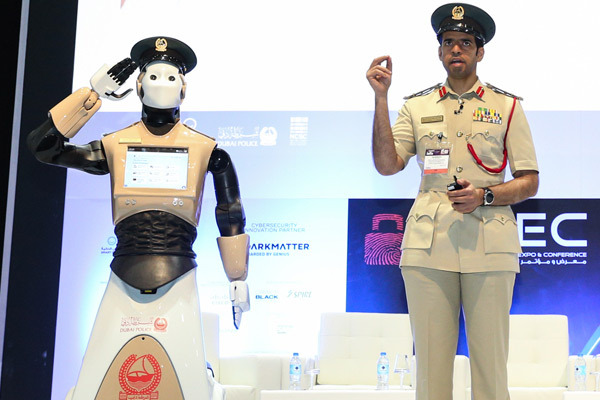 The world’s first operational robot policeman, officially joined the line of duty today, greeting guests at the opening of the 4th Gulf Information Security Expo and Conference (GISEC), including Lt Gen Dahi Khalfan Tamim, head of security for the Emirate of Dubai, who opened the show at the Dubai World Trade Centre (DWTC). The autonomous Robocop, standing 170 cm tall and weighing 100 kg, is equipped with an emotion detector which can recognise gestures and hand signals from up to 1.5 m away. The Robocop can also detect a person's emotions and facial expressions – whether the individual is happy, sad, or smiling - and has the ability to change his expression and greetings accordingly to put people at ease. When patrolling the streets, the Robocop which harnesses Internet of Things, Artificial Intelligence and the latest smart technologies, can use its facial recognition software to help police officers identify and catch offenders, as well as broadcast live video feeds. The Robocop will patrol the halls of GISEC until Tuesday evening before moving to high-density areas of the city. The RoboCop’s wide-ranging skills include the capability to map the insides of a building and navigate its path automatically via its self-control and drive feature. With a built-in tablet device, people can complete smart police services through Robocop using credit cards for payments, resulting in an enhanced customer service experience. Robocop can also transmit and communicate in six languages, including Arabic, English and more. Additionally, it can chat and interact, respond to public queries, shake hands and offer a military salute.